Immediately my mind flashed up numerous images of fictional and real-life dogs I had heard of. This was not an off-the-cuff kind of answer I could give straight away. Therefore I have decided to narrow it down and choose only 5 hero dogs from an exhaustive list and put it up to a vote. I apologize in advance if your favourite does not feature, but please let me know. Down the bottom of the post you will find some of those who so nearly made the list. Generations of children grew up with the adventures of this loveable Collie. 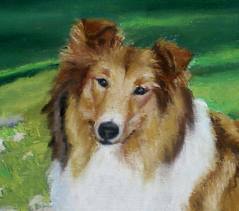 Lassie had the ability to make herself understood perfectly, perfecting her bark to have a vocabulary such as “mineshaft”, “well”, “stuck in”, “fallen down”, etc. Most dogs are known to have 7 different barks identifying their emotions, making Lassie’s abilities pretty damn impressive! I did however find it slightly suspicious that people hanging around Lassie often ended up in serious trouble. Therefore much like if Jessica Fletcher (from Murder She Wrote) were to turn up, I would fully expect disaster, death and accidents to happen. Keep one eye on that pesky Collie! This Great Dane was phenomenal, not only mastering talking English (albeit with a strong dog accent), but often walking on his two hind legs without the slightest problems. 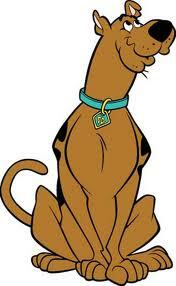 To call Scooby a hero is a little dubious; in reality he is a massive coward, running away and avoiding danger at all costs, but always ultimately solving the mysteries and crimes, hence the producers called the show after him. When the bad guys were caught and exposed they famously said “I would have got away with it if it hadn’t been for you pesky kids” they all failed to see the true genius behind their demise. To further cement his fame, the band The Fun Lovin’ Criminals even wrote a song called “Scooby Snacks”. It must be mentioned unfortunately that many have tried to tarnish Scooby and his best friend Shaggy down the years with allegations of drug-use. However at time of writing neither of them have been convicted or charged. Yet another TV-series from my youth. My parents used to awake early on a Saturday morning to their son singing the theme tune whilst sat in front of the TV downstairs: “Maybe tomorrow, I’ll want to settle down, Until tomorrow, I’ll just keep moving on.” I think they feared / hoped (delete as appropriate) their son was planning to flee the family home. 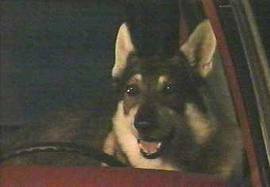 This delightful little dog (sort of German Shepherd mix) would wander from town to town, befriending those in need, helping them and then departing, asking for nothing in return but little appreciation. Many tried to adopt him, but he was a free spirit, knowing his mission was to carry on and help others somewhere else. He starred alongside (and completely upstaged) some great actors, including Michael Ironside, Mike Myers, Leslie Nielsen, amongst others. Dogtanian and the Three Muskehounds again graced my childhood. Loosely (or completely) adapted from Alexandre Dumas’ d’Artagnan, this hound was slick, cunning and a dab hand with his sword. Much like Scooby, Dogtanian had mastered balancing on his hind legs. 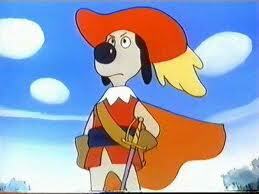 Dogtanian evidently commanded the main role in the series and in the first ever episode he travelled to Paris to become a Musketeer to King Louis XIII of France. This was an incredible honour for such a kind and humble hound. Together with his Three Muskehounds, (Porthos, Athos and Aramis) they endured many adventures, whilst he courted Queen Anne of Austria (just to alleviate any fears or concerns, she was also a dog-character, not human). 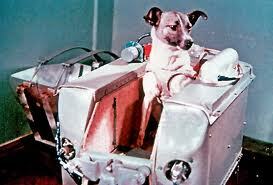 Older readers of this post will need no introduction to Laika (the Space dog). I remember my father first telling me the incredible (and sad) story of Laika around the age of 5. It has fascinated and saddened me ever since. For those unaware of Laika, here is her story. Laika was originally a stray dog, picked up off the streets of Moscow. After months of training she was selected to be the sole occupant of the spacecraft Sputnik 2, launched by the Soviets into outer space on 3rd November 1957. At this time the technology to de-orbit had not been invented, therefore Laika was ultimately a Soviet sacrifice (and pawn in the Cold War Space-race) to enhance their understanding of spaceflight and weightlessness. Unfortunately due to several malfunctions Laika is thought to have suffered a long drawn-out death, though exact details are still conflicting to this day. This “experiment” and mission caused worldwide controversy, especially in the UK where the National Canine Defence League called on all dog owners to observe a minute’s silence. In 2008 a monument to Laika (featuring a dog standing on a rocket) was unveiled near the military research facility in Moscow which prepared Laika’s flight to space. Many famous dogs just failed to make this list (Diefenbaker from Due South, Snoopy, Beethoven (from the many films), Rin Tin Tin, Brian Griffin from Family Guy, Hooch from Turner and Hooch (evidently), Santa’s Little Helper from the Simpson’s. A special mention is also more than merited for all the true hero dogs that don’t seek fame, giving non-stop and selflessly back to society including Police Dogs, Military Dogs, Guide Dogs, Helping Dogs and all dogs that loyally and faithfully play their vital roles in our everyday lives. ← How did we end up in Oslo?